As online shoppers become increasingly savvy to the cyber threats they face and the cyber threats themselves increase in complexity and frequency, how do you prove that you are who you say you are online? Once upon a time SSL certificates and the address bar padlock that comes with them was enough to reassure consumers that your site is secure enough to buy from. Now with the phenomenal increase in the sophistication of phishing attacks, consumers are questioning more and more whether your site is real or a malicious imitation. An SSL certificate only shows that the information send via the connection is secure but, as they can be bought for any domain name, it does not prove the business behind the site is genuine – just that the information sent is sent securely. What’s to stop a cybercriminal setting up a domain containing the name of any high street bank, securing it with an SSL certificate and imitating the bank to harvest users’ details? This is where the next generation of SSL certificates come in. Extended Validation certificates (EV SSL) add an extra layer of protection to the site by demanding that the company verifies who they are before a certificate is issued. 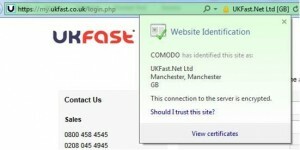 The end result of this strenuous verification process is not only the padlock by the address bar to tell you that the connection is secure, there’s also the company name to which the certificate is registered. Add to this the fact that the address bar also turns green, giving a highly visual reference to the security of the site. Research has shown that the added security and reassurance of EV SSL certificates has a significant, positive effect on the shopping cart abandonment rate of e-commerce sites, as well as increasing conversion and trust in e-retailers. Gaining the trust of consumers is an essential part of online retailing especially considering the results of a recent Gartner study which revealed that 20% of shoppers still will not make a purchase online. For a limited time we are offering 20% off the cost of EV SSL certificates. 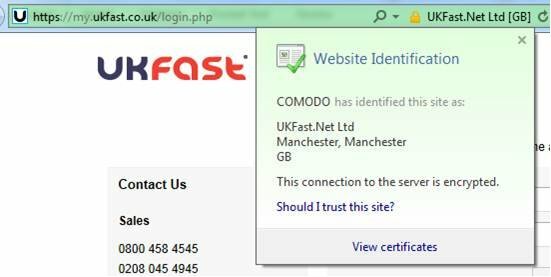 We have also automated the purchase process so you can request your SSL certificates, standard or EV, online through your MyUKFast portal. If you do not currently host with UKFast, you can create a MyUKFast account via the link. If your hosting solution is with us, we can also install your certificates quickly and simply for you.